Kamloops Festival of the Performing Arts (KFPA) plays a vital role in the cultural growth of our Kamloops region through the performing arts festival held annually for three weeks, February through March. Their over 1450 registrants perform their skills through the 11 disciplines sections they have available. 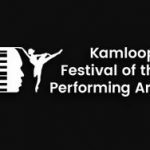 These performances are held at several venues throughout Kamloops with each performance able to be adjudicated by a professionally contracted artist. The three-week festival is a coordinated effort of over 100 volunteers throughout the year through a Board of Directors of the registered non-profit society's responsibility over the past 86 years of Kamloops history.